Japan is the second-largest real estate investment market in the world. That’s according to a June 2018 report from leading investment research firm MSCI Inc., which said it was worth US$798 billion in 2017. Most people aren’t aware of that fact, even Japanese investors. Many who do know still hesitate to get into the property investment game here, despite the possibilities. Why? Well, one major problem investors from abroad face is a lack of information in English about this market—or in any other language, for that matter. 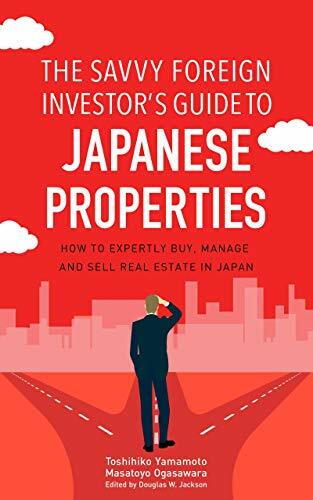 Consequently, foreign investors—who are the primary audience for this book, including foreign residents of Japan—don’t know how the Japanese market works, what kinds of properties to look for, who to deal with (and who to avoid), sources of financing or what yields to expect. This book answers those questions, and a great many more. The answers are based on my own decades of experience in investing in property here, feedback during regular seminars I’ve provided for fledgling investors for the past seven years, and from the perspective of a licensed real estate broker. I bought my first condo at the age of 27, and my first residential building—a 13-unit apartment complex in Tokyo—in 2008, and another 13-unit complex in Chiba. I’ve dealt with real estate agents and brokers, property management firms, contractors providing renovation services and many others. Let me acknowledge two more issues: the real estate business in Japan does not have a stellar reputation—something that is also unfortunately true elsewhere—and very few in the industry are equipped to deal with foreign investors. I am one of the few who can. My background has a great deal to do with that. I was born and raised in the international port city of Kobe, and have a B.A. in economics from Osaka Prefecture University as well as an MBA from Bond University in Australia. I began my professional career in Tokyo working for a large trading company, Nissho Iwai Corporation (now Sojitz Corporation). I’ve held senior positions at major multinationals, including an international video game company, Konami Corporation, and a major Hollywood studio, Sony Pictures Entertainment. I also worked in London for over five years as a commodities trader. Along the way, I’ve conducted business with hundreds of people from over twenty nations, including China and Hong Kong, Australia, the U.S., Germany, the UAE, Tanzania and Thailand. Even if I don’t really know the country firsthand, I can handle the cultural differences and cues, and always respect them. I doubt that you’ll find this combination of insider insights and information on the Japanese property market anywhere else. I also provide up-to-date information on market trends via my blog, https://www.toshihikoyamamoto.jp/, and on LinkedIn. You can find links to my LinkedIn, Twitter and Facebook pages on my blog. My advisory welcomes all inquiries about the possibility of investing in what is one of the most stable and profitable real estate markets in the world. My network extends beyond Tokyo, and I’m happy to connect you to others I trust in areas I do not cover directly.